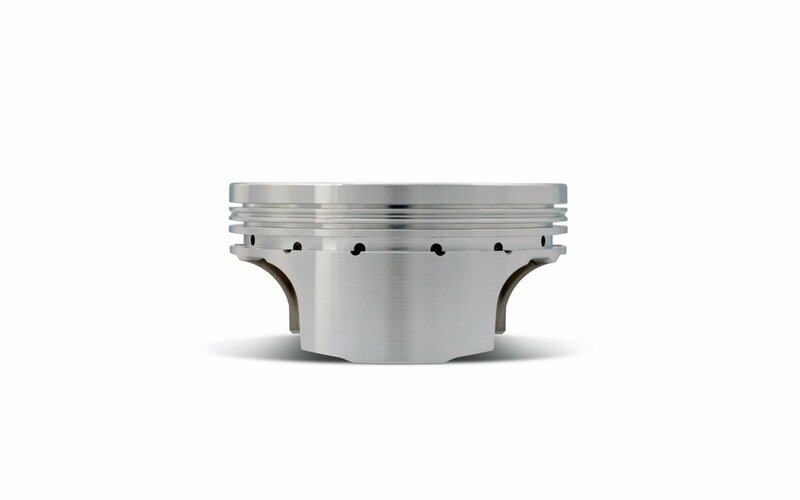 JE, our largest indigenous racing piston maker, brought a fresh new presence to asymmetrical forged pistons when they began investigating their potential in race engines, particularly high performance forced-induction engines. As you’d expect piston side loads increase with boost pressure—they also increase with longer stroke crankshafts and even aftermarket camshafts. But JE’s asymmetrical piston with differing skirt sizes and off-set pin has presented several interesting solutions. 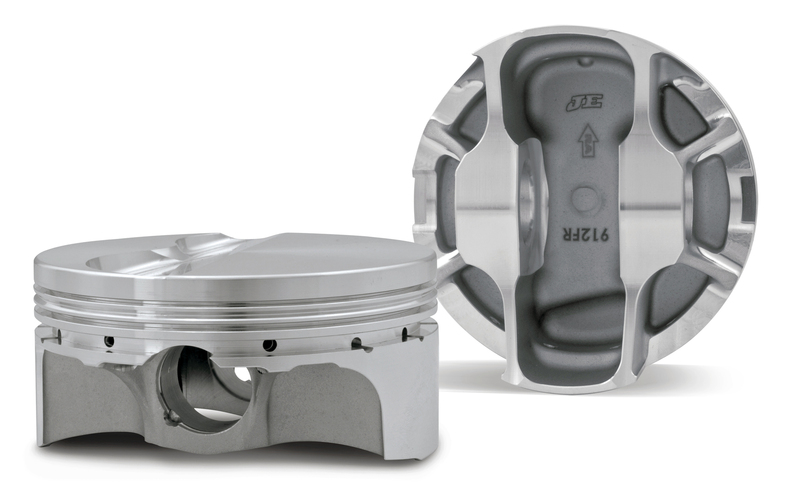 Irvine California: JE has pioneered a new range of asymmetrical pistons for GM LS engines. Available off-the-shelf, they are the first of their kind. Known as asymmetrical because their skirts are of noticeably different sizes—a thrust side and a non-thrust side that address disproportionate loads in the cylinder. Also, their piston pin is positioned slightly off center. 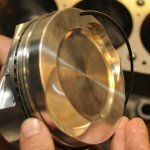 Though designed to support high cylinder pressures in applications producing 1,500hp-plus, both forced induction and nitrous, they also operate happily in naturally aspirated LS engines. 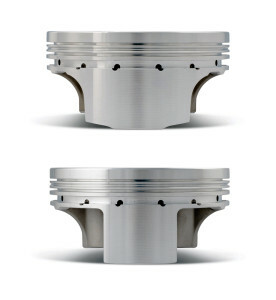 Beyond this the piston configuration promotes lightness, strength, and durability as its unique design enables material to be distributed in the areas exposed to higher stresses. The major skirt, which operates on the thrust side, combats the highest side loads. The lowest side loads, in contrast, are handled by the minor skirt, which is free of undue weight and friction. Further weight reductions are achieved with 106-gram piston pins. Measuring 2.250in long these compare favorably with the pins of traditional full-round piston designs that measure 2.750in and weigh 130 grams. Developed from 5115 alloy steel they are produced with a wall thickness of 0.150in. However, greater wall thicknesses are available as well as upgraded materials to custom-tailor each combination. Pins and accompanying round wire locks are included in each piston kit. 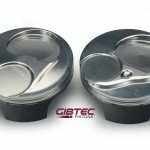 Created from 2618 aluminum alloy, these pistons are machined to suit rings of 1.2mm, 1.2mm, and 3mm. 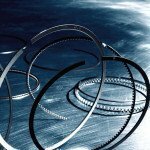 Significantly JE’s Pro Seal ring pack distinguishes itself by including a carbon steel nitride top ring. Inherently suited to nitrous and forced induction, it has a more durable ring face than the plasma moly inlay type. The most interesting element of their second ring, a Napier-style hooked face ring, is that it possesses oil control attributes not found in conventional tapered second rings. The remaining component of the ring pack, the oil control ring, is 3.0mm with standard tension. However, it is devised to operate in conjunction with the special qualities of the Napier. Also noteworthy, these new asymmetrical LS designs accommodate factory oiling squirter systems, which will continue to spray in the correct locations and keep the pistons cool. To further reduce the likelihood of hot spots and pre-ignition, JE adds smooth-finish crowns, a process that blends all the edges of the piston crown, including the valve reliefs. Well-engineered and robust, JE’s new asymmetrical forging designs allow for the use of the most popular stroke and rod combination while eliminating reluctor wheel clearance problems. 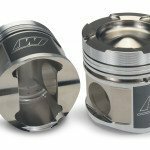 Finally, JE maintains stocks of over 200 configurations of LS-series pistons for all popular combinations, produces custom pistons in two weeks or in five days when expedited, and ships to 95 percent of its customers in two days.